Crochet leaf patterns can be used for so many different projects both individually or in sets. Stitched together, they can make great bunting for decorating a party, classroom, or home. As motifs, they can be attached to hats, scarves, purses, and other accessories for a little bit of unique "pop." Although the design tends to show up most often in autumn and then again in spring, crochet leaves provide great detail on designs used throughout the year. If you like to make the same pattern over and over, adding leaves in different colors is a great way to create a small change. You can stick with the traditional or go more edgy, funky, and colorful in your designs. These free crochet patterns for leaves run the gamut of styles and applications. 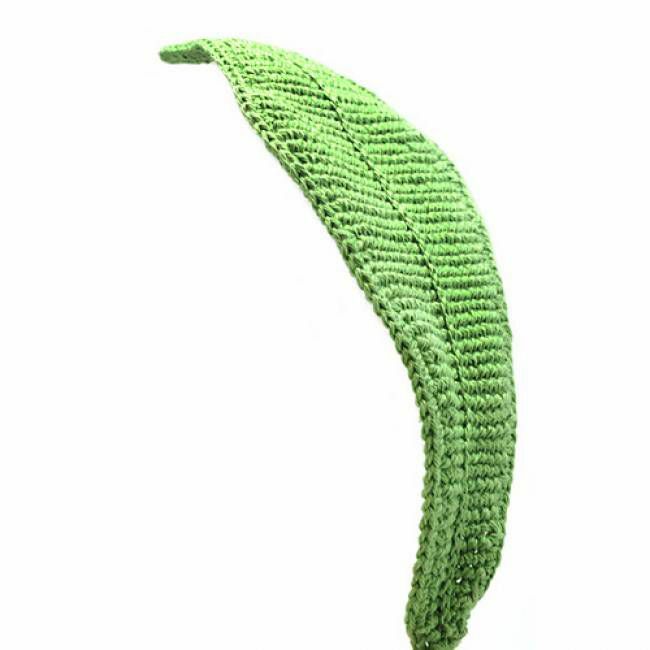 This beautiful long green leaf is made using basic crochet stitches including single crochet and double crochet. It is one of many beautiful pieces from YarnPlaza that can be used to make a stunning bouquet. This easy free crochet pattern is worked using basic crochet stitches. The placement of the stitches is what creates the terrific curving shape of the oak leaf. Crochet designer In The Yarn Garden offers this free leaf pattern in both English and Swedish and includes a detailed symbol chart to make it even more clear. In The Yarn Garden is the (bilingual) designer of this simple free crochet pattern for an easy leaf that isn't intended to look specifically like it came from any one type of tree. This basic leaf design can be worked in every color of the rainbow to use in any season of the year. This is another one of those patterns that are so fun to use as an appliqué on other projects. Pop one onto the corner of every blanket you make for a pretty and unique signature. Crochet wreath patterns don't always feature leaves but they certainly can. In this terrific example, we see a wreath of autumn-colored crochet leaves applied to a beautiful afghan square. You could mix and match colors on many squares to create a stunning blanket. Button details add additional texture to this Ravelry pattern by Darlene Swaim. In this simple free crochet pattern, you begin with a foundation chain in one color to create the central vein of the leaf, then you switch colors (in this case, darker or lighter green) to work the leaves around both sides of that short foundation chain. The stitches are simple, although they do include taller crochet stitches like the double treble stitch, and these little leaves by AYarnyRobin will work up quickly for addition to any project. You also could make a bunch of these in a variety of colors and store them in a vase or glass jar for a pretty desktop display. There are just 20 rows to the chestnut leaf design in this free purse crochet pattern that Elaine Phillips offers through ABC Knitting Patterns. If you are simply looking for a crochet leaf pattern, it's a great design and you could stop right there. But, of course, the felted autumn purse is a stunning accessory, and you might want to go on to create the entire thing. That is done by crocheting 20 individual leaves that are then strategically stitched together. It's an amazingly detailed design. This large crochet leaf is worked first in the round and then later in rows to create the many lobes around the circle. It's a beautiful design for a large leaf that would make a great doily or wall art. You could work with bulky yarn and a larger hook and use the pattern to create a leaf-shaped blanket or floor rug. Note that this free crochet pattern by Robootkomania is a symbol chart pattern, so you will have to know how to read crochet charts to complete the leaf. The pattern does come with basic instructions for the first two rounds to give you a sense of the way the chart works, in case you just need a refresher. It is common to see crochet leaf patterns for oak leaves, acorn leaves, and maple leaves, but it is definitely not so common to find a pumpkin leaf crochet pattern. Kim Guzman has created one for us. It's a small three-round crochet pattern, but it gives you the opportunity to practice some fun stitches—foundation single crochet and extended single crochet. The Ohio buckeye leaf is another little design that is actually really fun to create. Designer Kate Graff explains that the leaf is made up of five petals in three different sizes, and she shares how to create each of them. Together they look almost like a flower in their own right. Kate's free crochet pattern also includes the pattern for the buckeye nut. Crochet Leaf is a website that features many free crochet patterns, most of which are not leaves. These garlands, however, are leaves indeed. The free crochet pattern is available in both US and UK crochet terms with a photo tutorial showing exactly how to create the leaf portion of the project. This same pattern could be used to create a leaf necklace. There are many versions of this basic crochet leaf, worked using simple crochet stitches in various heights to create the rounded shape around the foundation chain. This one from Crochet/Crosia comes with detailed step-by-step tutorial photos so you can get a good sense of exactly how the leaf is created. The easiest way to change the size of this leaf is to increase your hook/yarn size. This micro-crochet amigurumi pattern for a little mouse comes with a tiny little leaf bed pattern that the mouse can get tucked into at night. Even if you don't want to make the mouse, you might want to crochet a set of these cute curling little leaves! This pattern is a Ravelry download from April Lesley. This classic autumn leaf is easy to crochet, using a combination of single, double, and treble crochet stitches worked in the round. The design, by The Painted Hinge, works for all types of leaves but is specifically intended for the colors of fall. Most crochet leaf patterns are worked in traditional crochet, but you can create them in different niches of crochet as well. If you have some Tunisian crochet hooks that you're itching to put to use, this free pattern from Anette Bak will let you use them to work up beautifully textured crochet leaves. Nadia Druzinina uses a combination of basic crochet stitches, taller crochet stitches, puff stitches, and post stitches to create this unique white crochet leaf inspired by Irish crochet techniques. This is a lacy, openwork crochet leaf pattern that would be amazing in other colors as well. Cream of the Crop Crochet has an adorable free crochet pattern for a baby hat for preemies and newborns. As you can see, it also is decorated with crochet leaves. The crochet leaf pattern is a very simple one but what is unique here is that the designer shows how to use a button to attach two leaves at an angle to give them a unique shape. This is great inspiration for a wide range of projects. You can create a stitch pattern that looks just like scattered leaves. Once you know how to do it, this pattern can be made in any size. Therefore, you could use the free crochet pattern from MyPicot to create a shawl, a blanket, or anything in between. When you visit the website, you will see that the design looks considerably different depending on the colors you choose to make the stitch pattern. A solid green definitely looks like leaves. A variegated pastel yarn makes a pattern that's slightly more difficult to define as "leaves," although you see it when you look closer. You could do an ombre of fall colors to create a seasonal representative of the changing leaves. Have fun with it. Beautiful Crochet Stuff is a terrific website with stunning free crochet patterns, especially for clothing. If you are ready to take your leaf making to the next level, then this leafy tunic is a fabulous free crochet pattern to do.